WEST LAFAYETTE, Ind. -- You're at a softball game on a hot, sunny summer day. You left the sunscreen in the car, so you put the baby down under a tree, figuring the shade will protect her. Cancer-causing ultraviolet-B (UVB) light can snake its way around the shade, according to research by Purdue University agronomist Richard Grant and the U.S. Forest Service's Gordon Heisler. Their research was reported in December in the International Journal of Biometeorology. Because you can't actually see UVB, Grant says, you can't easily gauge how much is hitting you. People commonly -- and mistakenly -- equate the amount of UVB exposure to the amount of visible light they see, according to Grant. "When people in the shade estimate UVB exposure based on an eyeball assessment, they're getting about twice as much UVB as they think," Grant says. UVB, unlike visible light, doesn't shine down in a straight line from the sun. It bounces around in the atmosphere. "How much UVB you're getting more closely correlates with how much sky you can see," Grant says. "If lots of the sky is obstructed, you're getting a lot less UVB." In other words, if you're in a grove of trees or surrounded by tall brick walls with direct light hitting you, you're probably better off than you would be in the dense shade of a lone tree in a field. What about winter exposure? Snow reflects between 30 percent and 95 percent of the UV reaching it, while green summer grass reflects only about 5 percent, Grant says. However, UVB exposure generally is less on a snowy day than on a sunny summer day, because the amount of UV reaching earth at a snow-producing latitude of 40 degrees is about three to five times higher in summer than winter, according to Craig Long, a meteorologist for the National Weather Service. There are exceptions. People skiing in the mountains of Colorado face greater exposure risks because the thinner air layer absorbs less UVB. Two types of ultraviolet light hit the surface of the earth: UVA and UVB. UVA gives people a tan, but causes little harm to plants and animals. The shorter-wavelength UVB, on the other hand, can damage plant tissue. It also causes skin cancer in humans and can impair immune systems. Grant and Heisler noticed that articles in the popular press urged people to duck into the shade to avoid unwanted ultraviolet exposure. That advice ran counter to what Heisler and Grant knew about the way UVB travels, but they couldn't find any studies that proved the point. So they decided to do their own. With combined funding from Purdue and the U.S. Forest Service, Heisler and Grant took measurements of UVB along tree-lined streets, in farm fields and in grassy areas away from streets. 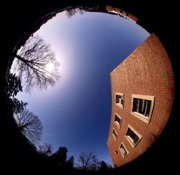 At each test point they also took a fish-eye view photo, which gave them a complete picture of the sky and allowed them to measure how much sky-view was obstructed.